ASUS today announced its new range of ZenBook, VivoBook, and a new ROG Chimera gaming laptop. let’s start with ZenBook Flip 14 (UX461) which is a thin 2-in-1 laptop with high-performance discrete graphics. 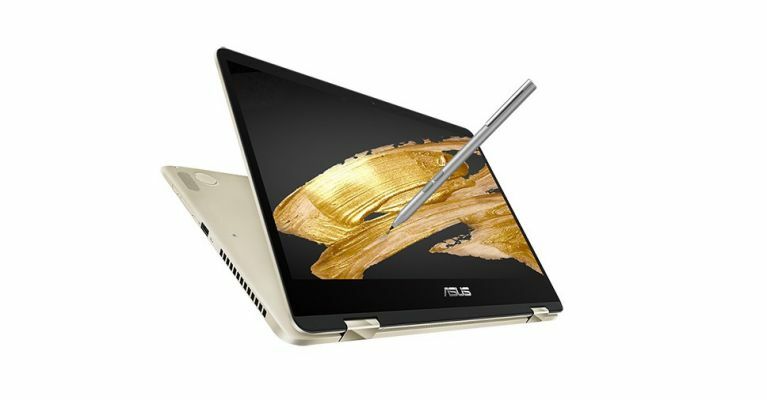 Only 13.9mm thin and weighing just 1.4kg, ZenBook Flip 14 features a 360° touch screen and ASUS Pen support. The latest 8th Generation Intel Core i7 processor. Up to 16GB of fast, 2400MHz DDR4 RAM. USB-C ports with Thunderbolt 3 and a powerful quad-speaker Harman Kardon audio system. NanoEdge 4K UHD or Full HD touchscreen display. The new VivoBook Flip 14 (TP401) is a fanless design which is only 15.4mm thin and weighs 1.5kg. The device features a NanoEdge design that fits a 14-inch Full HD display into a frame that is the size of a typical 13-inch laptop. The Full HD display has 178˚ wide-view technology with 7th Gen Intel Core i7 processor that powers VivoBook Flip 14 provides powerful, energy-efficient performance. VivoBook S14 (S410) comes with a NanoEdge display with a slim 7.8mm bezel. VivoBook S14 is powered by the latest 8th Generation Intel Core i7-8550U processor with up to 16GB DDR4 memory and NVIDIA GeForce MX150 graphics. The new Asus ROG Chimera gaming laptop features 144Hz display and a 7ms gray-to-gray response time. It’s powered Intel Core i7-7820HK processor and NVIDIA GeForce GTX 1080 graphics.